This post contains affiliate links for your convenience. Purchasing items linked to in this post helps keep this blog up and running, but don’t worry! I only recommend products I’ve used and love. You can read my full disclosure policy HERE. In our time in Texas, we’ve had a good share of delicious smoked meat. In our most recent move, we’ve come up next to neighbors that use their backyard smoker weekly, and are kind enough to provide us with some of the cooking on occasion. Finally, we decided to dip our toes into the Texas smoker pool. Because we’re frugal cheap, we didn’t want to drop money on a brand new smoker from a big box store, due to the rising cost of smokers. Smokers initially were built out of materials found around a homestead, and were used to allow for cheaper cuts of meat which would normally be tough, to still be delicious and tender. 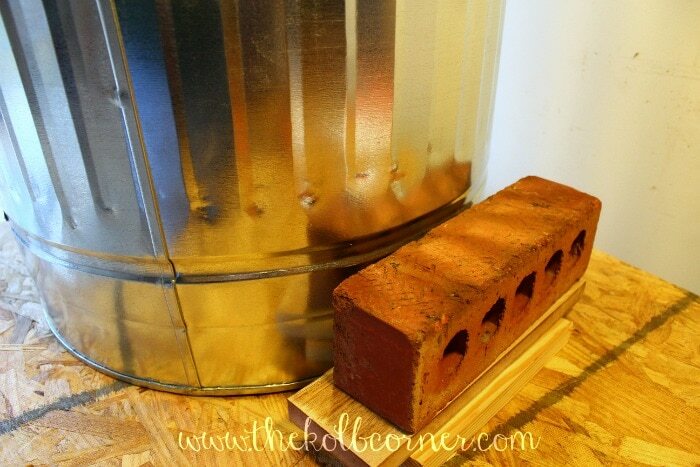 Not having any materials around that could be thrown together to make one, I decided to base one around a galvanized trash can. With a quick search of the internet I found a few mentions, but no good explanations or instructions on how to build one. At this point I decided to build one with the help of my neighbor who not only helped in some of the cuts, but provided valuable information from his experience of a lot of grilling and smoking. 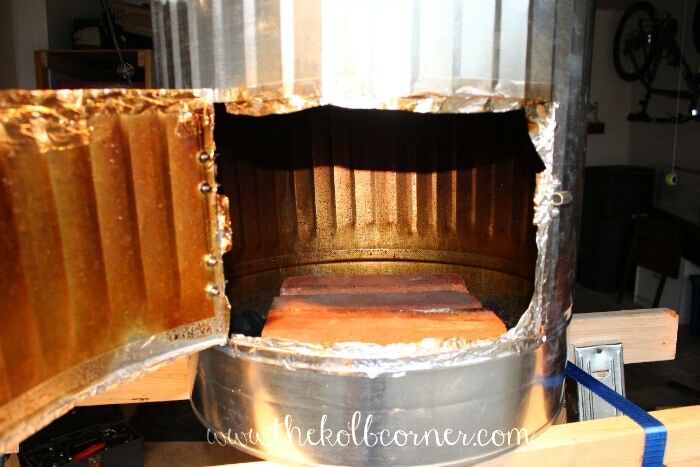 I should mention something I have heard and seen before and after building of this smoker. Some people warn of dangers of smoking meat in a galvanized can due to the possibility of fumes released from the zinc in the metal of the can. I decided that this does not pose a significant threat, for a couple of reasons. First, this concern is based on the thought that cadium,which can release toxic fumes, is used for the trash can. Cadium is not actually used in the galvanization process of the trash can. 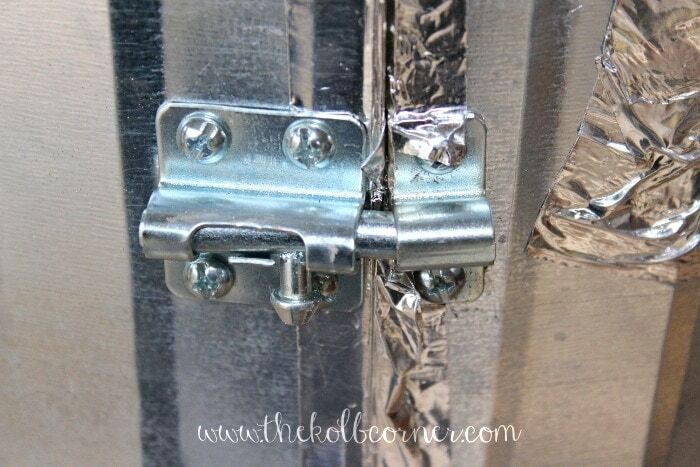 Zinc is actually used for the galvanization. Second, the boiling point of zinc is approximately 900 degrees, which the smoker will not actually reach. Finally, after using the smoker, the inside of the can will be coated with creasote, which will help to seal in any danger of possible fumes from the zinc. 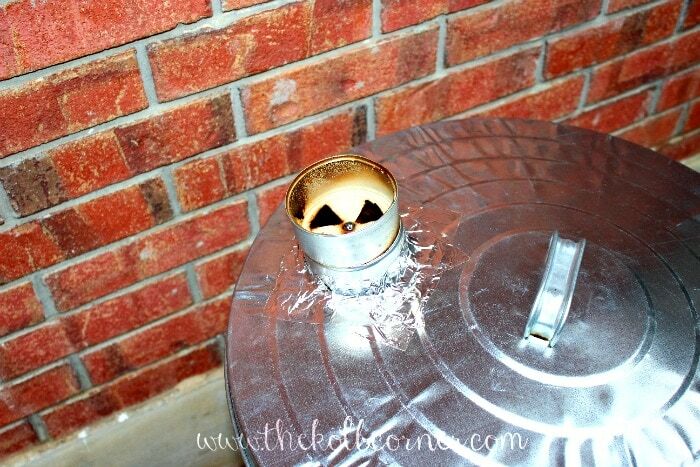 With this thinking, the concern is to be careful in making any cuts into the trash can, as well as preventing any embers or charcoal from resting on any galvanized surface. But, I’m not a professional on any of these matters, and I didn’t reference any source for this information, so you’ll want to make your own conclusion. 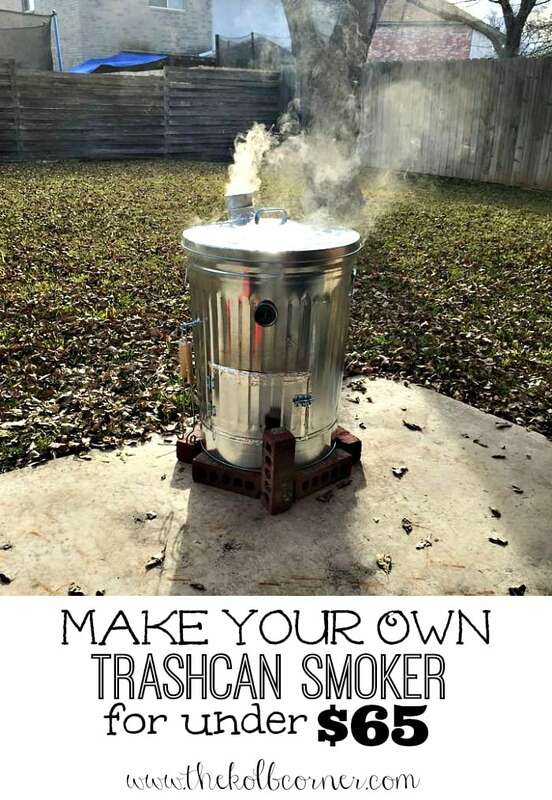 As you can see, these pictures were taken after making and using the smoker, so this is instructions afterwards, rather than a step by step during the process. Also, most of the measuring/engineering was done by eyeballing the materials, but it seems to work out well. The first step is to cut a hole for the door to access the charcoal/wood. 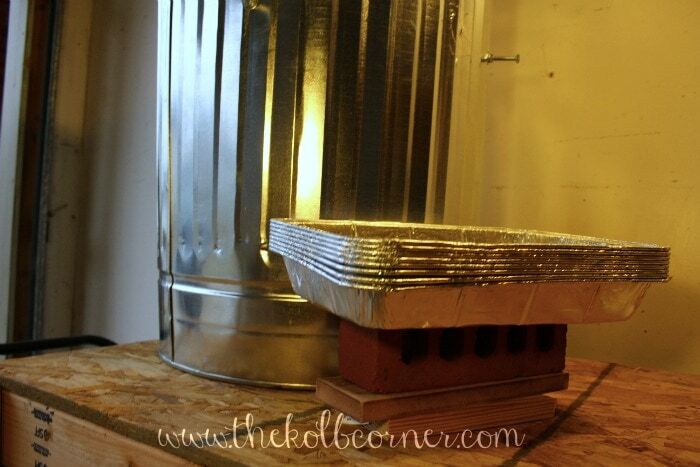 I decided to use to use aluminum foil pans to hold the charcoal and wood, and have this set up on bricks to prevent the pan from heating the bottom of the trash can. The bottom of the can is rolled, so the inside bottom is just over 1inch from the surface the can is sitting on. Eyeballing this by setting the bricks on a couple pieces of wood, 5 inches is a good place to make the bottom of the door. Additionally, there is a roll in the can around that spot, so even better to hold a straight line when cutting. For width, 13 inches will be good to access the entire foil pan holding charcoal. And, I decided on 9 inches for height of the door. Being in Texas, I’ll just be using pieces of Mesquite, rather than wood chips from a store, so 9inches will ensure that small logs can be easily placed inside. When making any marks on the can, I used a square to make sure that the door will be as close to 90 degrees as possible. Also, there are plenty of seams in the can, and I used those to make sure any lines are mostly straight. Next, just connect the lines for a rectangular door 13in wide, and 9in high. Laying the can sideways on a sawhorse, and using straps to connect the saw horses (so the can doesn’t fall through), makes it easy work. After the door is marked, but before cutting, we need to lay out the hinges and latch to hold the door. I can never get hinges straight, ever. 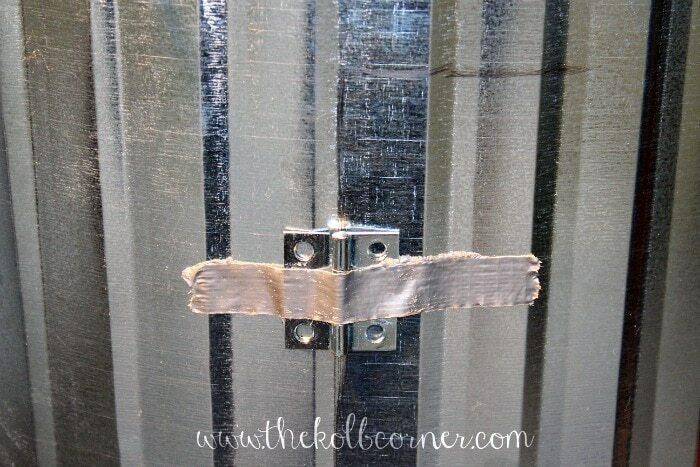 So, to make this easier, tape the hinges exactly where you will want them. Then, use that as a template to mark or drill your holes. I went ahead and drilled through the hinge and can while the hinge was taped up. I also dry fit all the bolts to the hinges and latch in the freshly drilled holds before making any cuts. One other note on this is that the latch is expected to be mounted on a flat surface, not a round can. To make the latch fit better, I found that placing a scrap of wood behind the can, and hammering where the latch will be mounted helps to flatten the surface for the latch. Once the door has been marked out, this can be cut using whatever cutting method you have handy. Due to the length of the cuts, an angle grinder with a cutting blade worked best. 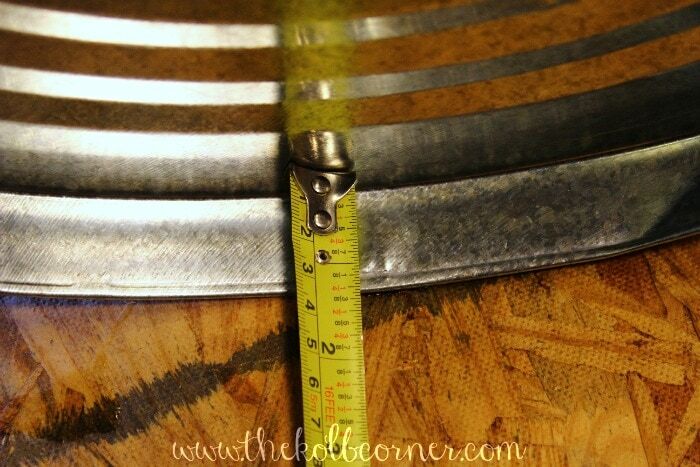 On finishing the cut, mount the hinges/latch, and then line the cut with Aluminum foil tape. When lining with the tape, be sure to give some lip to the tape to seal this cut. Some air is needed to get to the fire to allow the wood to burn, but we want to control that and not let it leak in through the cut around the door. Alright, that was the hard part, really. 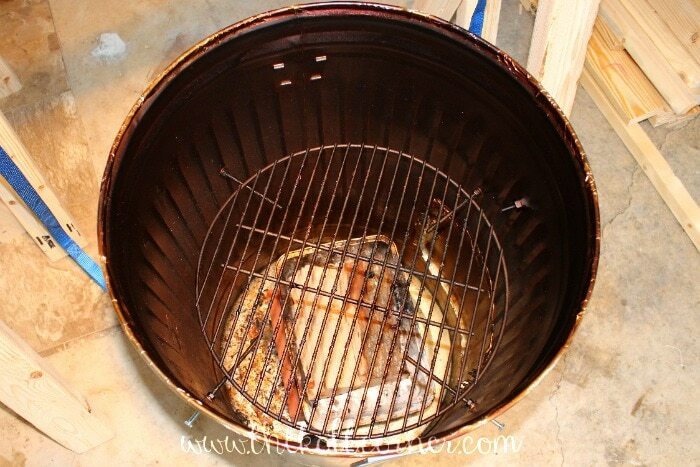 Next, I had my cookin’ neighbors point out where they think the charcoal grate should go for optimal smoking. This ended up being about 17 inches high, measuring from the outside of the can. Use the four bolts to bolt to the side of the can. We don’t need all six inches inside the can, really only about four inches. To gain some more strength from these bolts, I mounted them as nut → lock washer →fender washer → side of garbage can → fender washer → lock washer → nut. These should be roughly across from each other, but eyeballing seemed to turn out alright. 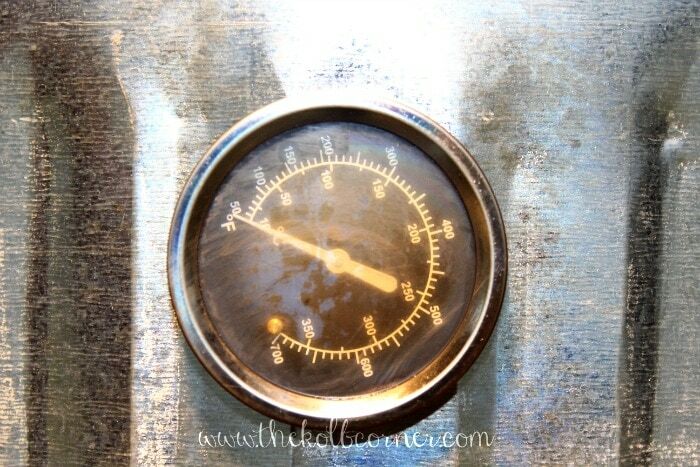 Next, throw the charcoal grate on there, and drill and mount the thermometer an inch or two above the grate. This is the best place for it, as we want to know the temperature of the space around the meat when we’re cooking. 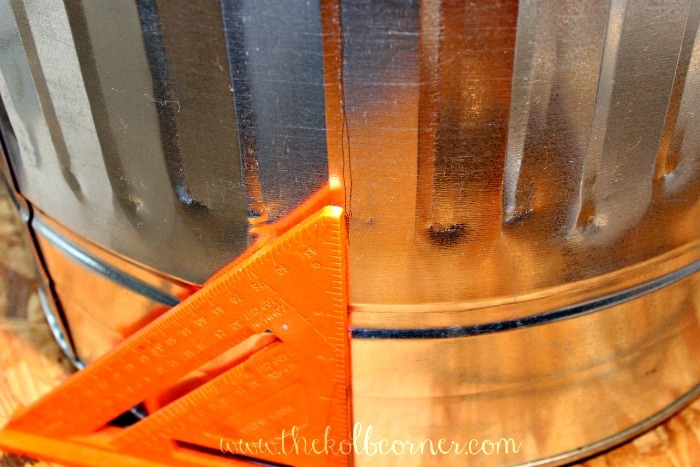 Bonus points, make sure it is tight but can be spun so your desired temperature is pointed up. Then all you have to do is look at the needle from a distance and make sure it is pointing straight up. 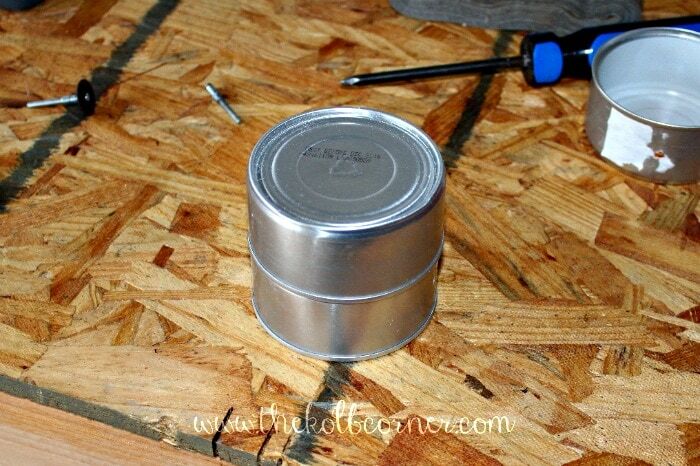 Now is also a good time to throw a strip or two of aluminum foil tape around the top edge of the can, where the can lid will sit. This helps to tighten up the seal of the lid a bit and seal in that delicious smoke. Alright, we have the grate mounted, the door cut, and thermometer mounted. Now we need vents. 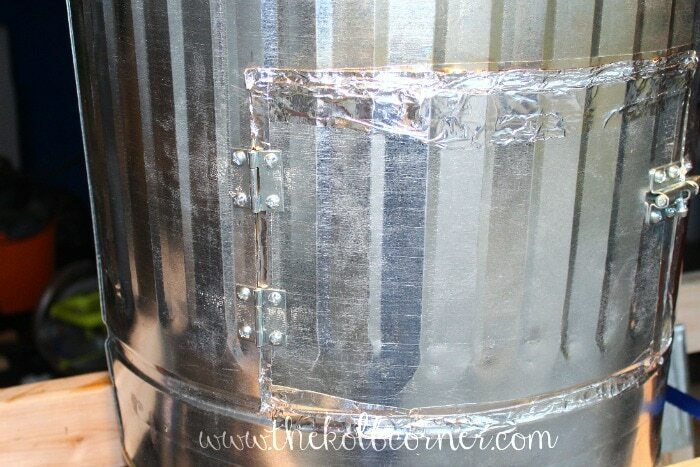 Initially I only put one vent in the top of the can, but found that everything else was too well sealed, and I had to add a couple more vents to the sides of the can to better control the heat of the smoker. 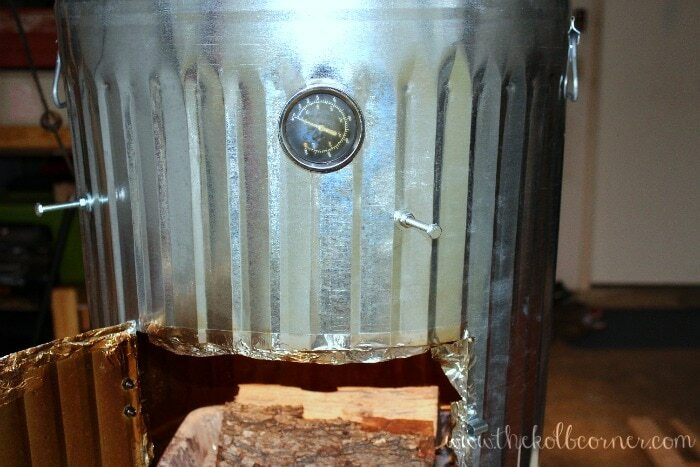 The problem was too little air was resulting in the wood smoking, but not being hot enough. This was somewhat mitigated by having the door open some, but this resulted in too much air causing the smoker to be far hotter than I wanted. 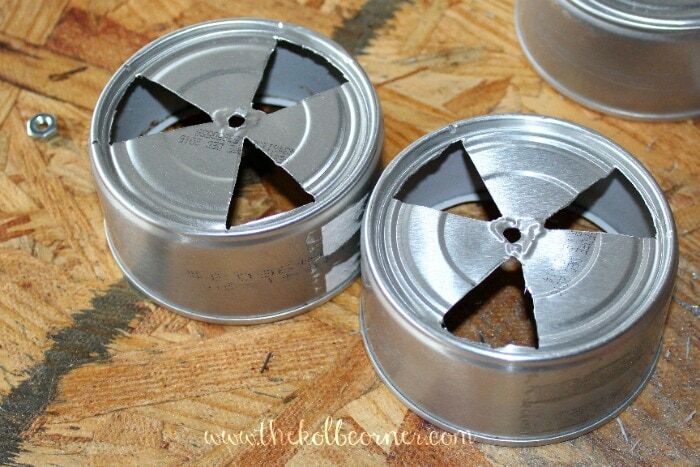 To help keep the smoker budget low, I used something we have plenty of, empty cat food cans. Really though, any can would do. If you’re really in a pinch, you could always just drill some holes, but then these can’t be adjusted. 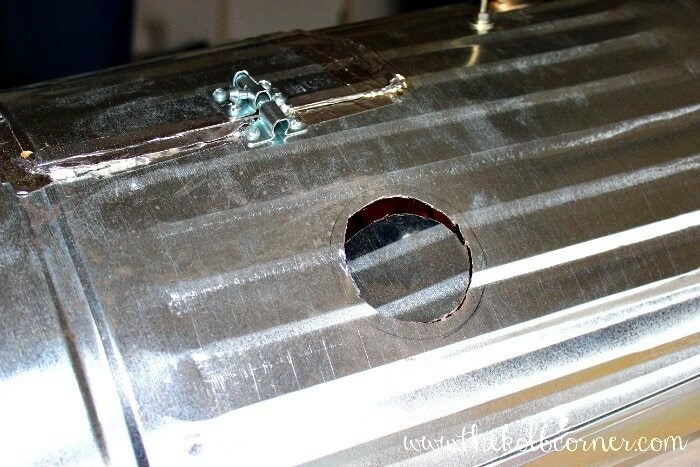 To mount cans for exhaust/vents, the first step is to trace around the can, and cut out that section. To ease in the eyeballing, cut a circle of cardboard the size of the cans, and stack them all up and drill through the center. 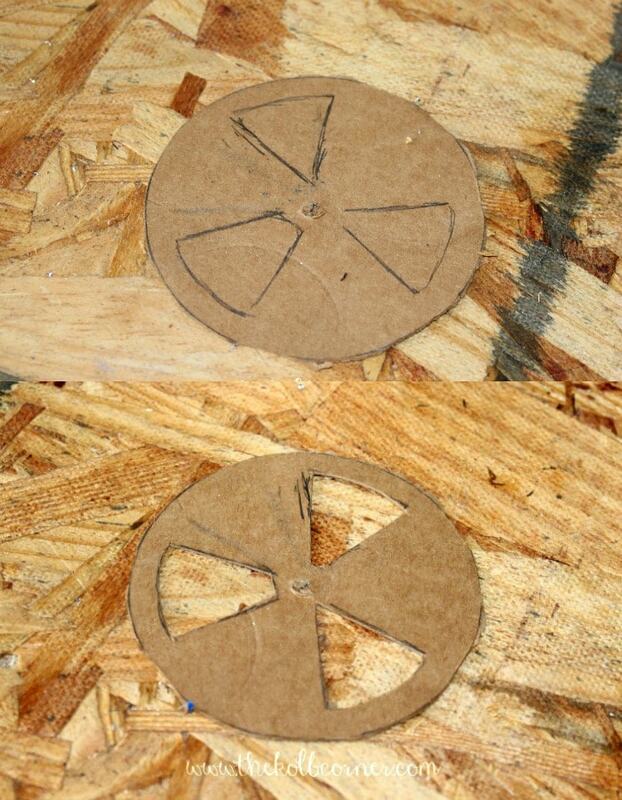 Draw an approximation of what you want the vent to look like on that cardboard, and cut that out using a razorblade. 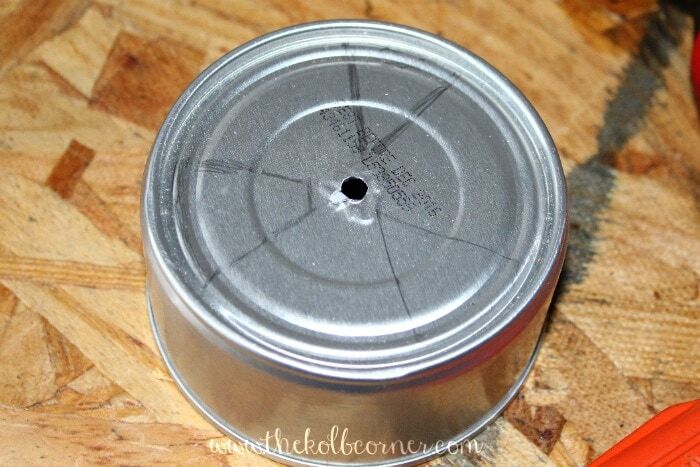 By drilling through the cardboard when drilling the cans, this gives you a perfect place to use a bolt to hold the cardboard in the center of the can. 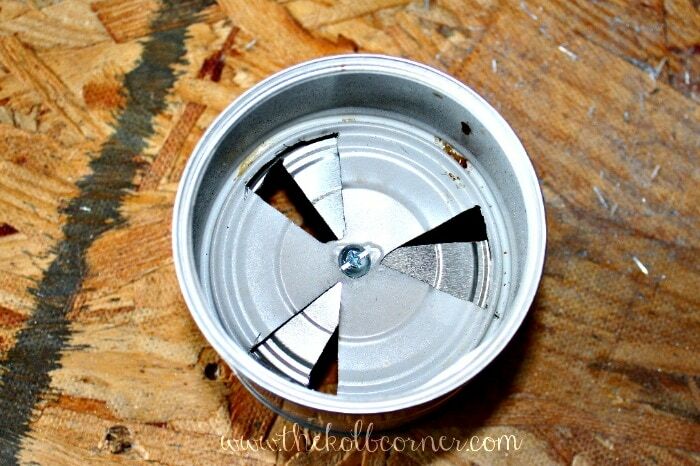 You can then use that to create a template of what you will cut out of the can. Have at it with your cutter of choice (I found a Dremel to work best due to the small size of the cuts). 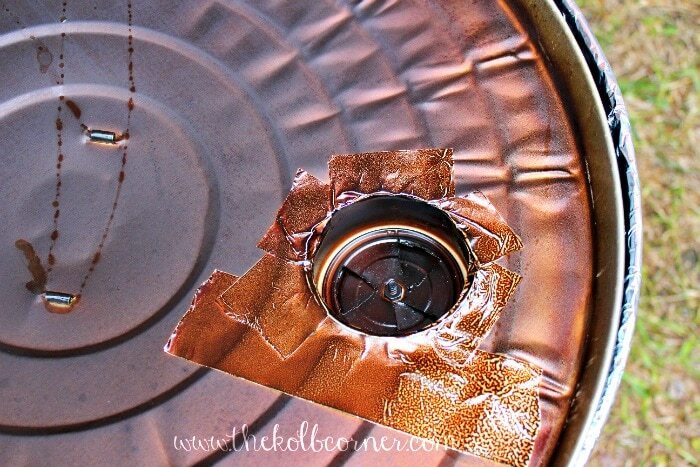 The aluminum foil tape is incredibly sticky, and will easily hold the can by taping around the edges. This will seal the vent, and hold the can. I did this for both inside and outside of the vents. And there you have it. 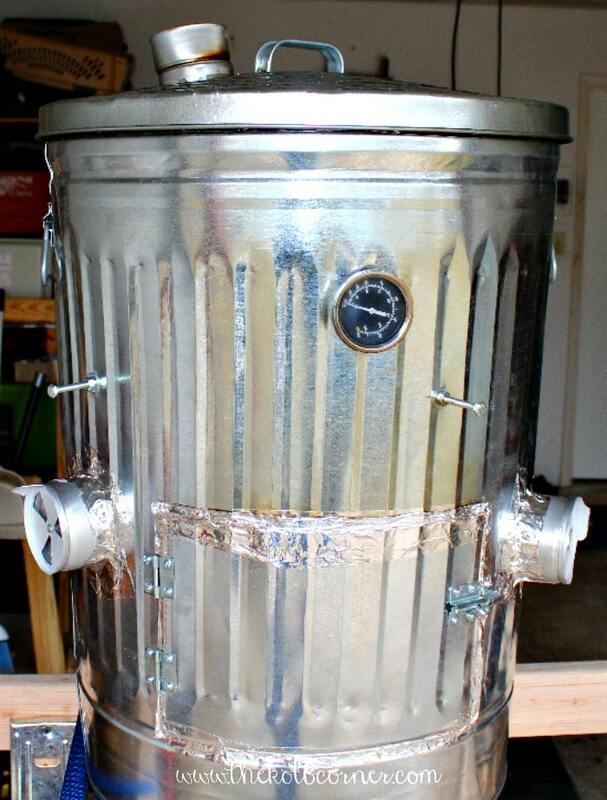 One complete trash can smoker, with extra vents to control airflow. 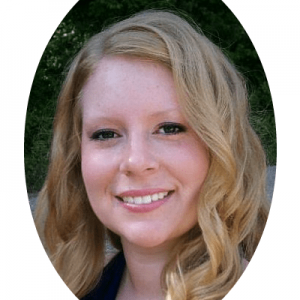 How cool Thanks for sharing at the Home Matters LInky Party this week! 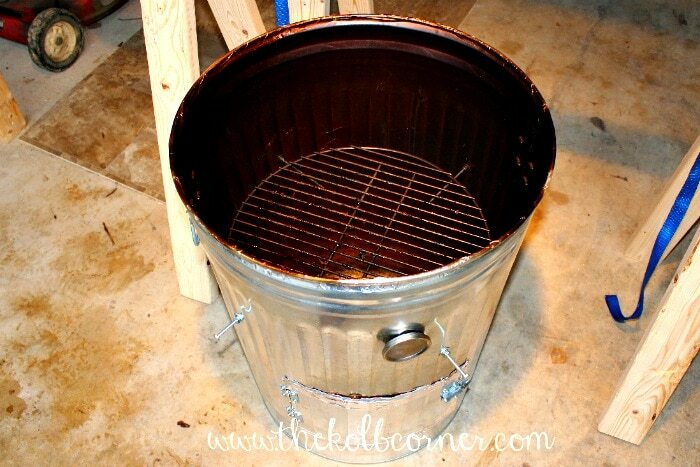 In another Pinterest someone mentioned coating the trash can with non toxic stove paint? 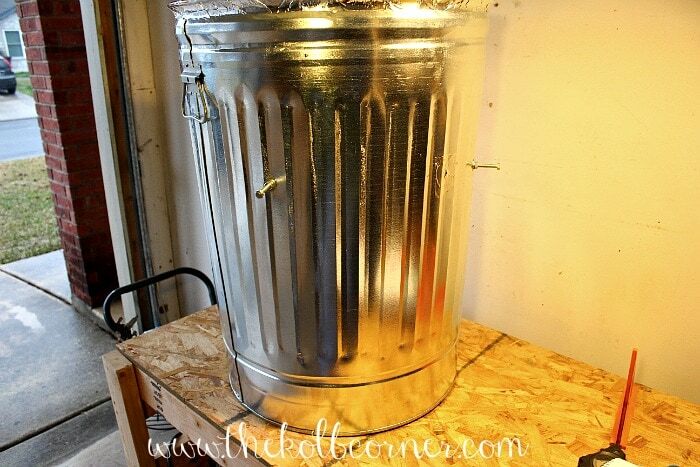 Something about regular aluminum trash cans giving off toxins when heated. Don’t take my word for it. Just CHECK into it to see. Thank you for looking out for us Amy! My husband did some research before using the smoker and realized that it does not pose a significant threat. 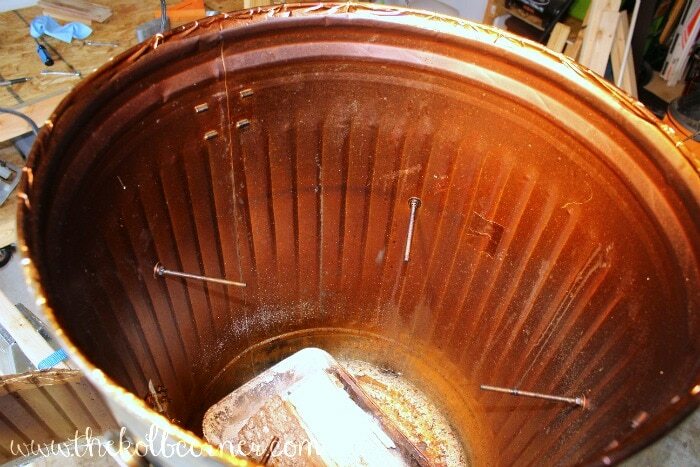 He goes into some detail about the galvanization process and boiling points in the beginning of the post. But, with that being said, there would be nothing wrong with using a non toxic stove paint to be on the safe side. We want everyone to feel comfortable with how they approach a project. Thank you so much for taking the time to reach out to me! Hope you are having a wonderful week. Galvanized steel is carcinogenic. Exposing galvanized steel to heart burns off the galvin and the Cancer producing fums go into the meat. Please research galvanized steel and it’s carcinogenic properties. 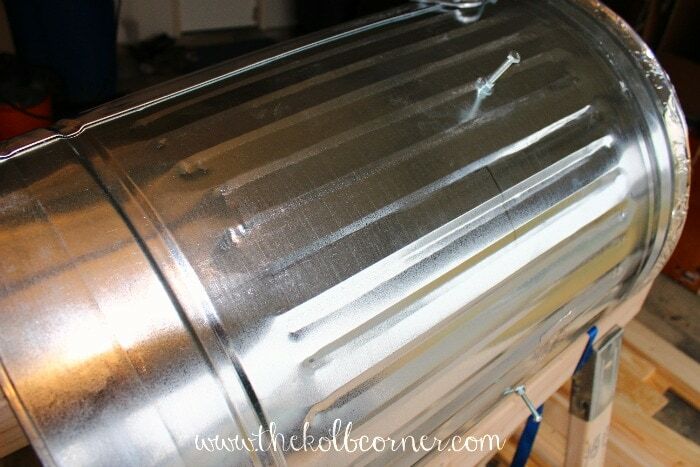 Please do not do this project unless you use a plain steel can. Thank you for your concern! However, my husband did address this issue in the paragraph just above the supply list. Our can and most like it does not contain Cadium which is the main concern with being carcinogenic when exposed to high heat. It does contain zinc, but zinc’s boiling point is well over 900 which the smoker would never reach.